"Masks" || 'beauty is more than skin deep.' When your skin does not reflect the status quo, finding your sense of beauty is a constant fight for personal acceptance. A constant practice of restorative justice. 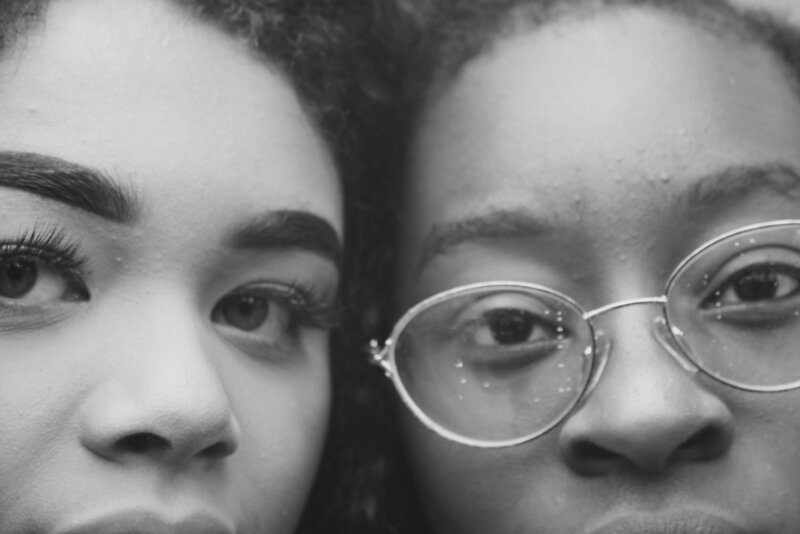 This past summer our Chief Blogger, Tyler White, worked with his best friend, Aaliyah Joseph, through a paid internship with Resolution Northwest, to create the first installation of a series of responsive videos, investigating issues of identity for blacks and the implications of white standards. Public transit is the equalizer of city change. People of all walks of life, come together in the narrow aisles of a forty-something seater bus, where there is no separator between the rich and the poor, the black and the white -- society’s melting pot. As I rode two of Trimet’s busiest bus lines, the 72-Killingsworth/82nd and the 4-Division/Fessenden, at some point it felt as if I had been transported to cities along the banks of the Mekong and Balsas Rivers, gently the melody of languages foreign and close to home soothed my experience throughout these changing areas. My trip, starting on N. Skidmore and Mississippi, featured characters similar to the Portland based, Portlandia. Milling in and out of taxidermy shops, teahouses, local businesses and microbreweries, these characters with no knowledge of this area’s history, move about aimlessly not knowing where they enjoy their chai teas, use to be a crack infested house. A house that had been home to three generation of middle class African-American, business owners, who had moved with the tide of a hopeful black population, prospering for generations until the hell-infested crack bomb, took the lives of the very people they had moved for-- their future children. Riding to the city center, three older black gentlemen, liven the bus with memories of their days as a young people. Never a shortage of substance, they move through topics from racial discrimination to government conspiracies and gentrification. My ears became glued to these voices. They were the voices of my uncles, cousins and grandfather, who had a bounty of knowledge, but the wrong skin tone. Their memories digging out my own ideas and perceptions of life, making me think deeply about who and what was in these areas, prior to me telling these stories. Out to the areas in which these communities of color now call home, is where I see the sparse glimmers of community pride in the small businesses, occupied by people of the Mekong and Balsas Rivers, but also their children, finding pride in speaking their household languages among friends at school. A young Hispanic boy got on the bus, in hand with his mother and her friend, who both seemed to be on her way to her job. The two speaking Spanish, so fluently, I felt myself ashamed not to have been able to engage too. Following, came a bounty of young people in the late morning rush hour, heading to work, the entry jobs that could possibly get them the house their mother had lost. On my trip to North Portland, I heard the stories of men that been sucked in by streets, going in and out of jail, one even recently stabbed at the porch of his home. But even the wake of this commonly thread theme of North Portland, being the “hood,” they had a firm pride for their own community. This pride broadened my eyes, as I rode through New Columbia, looking at the various flyers advertising community events from old Father’s Day Honors Brunch, to clothe drives and employment preparation classes. As I continued further into North Portland, the pride of being a homeowner illuminated as the bus passed the streets with immaculate yards, set in front of houses painted as if to smile, assuring you are safe. From the conversations that started with a simple question, “what are you doing?” to the smiles that made me feel welcome, but not enough to stay, as I travelled through the changed, bright, vibrant, new, fun, urban, white neighborhoods: Division, Mississippi and Alberta, I realized so much has changed, but the people coming in and the people who left remain the same. There faces do change colors, but life continues to go on. The hopes and dreams of new groups of people mixed with the anger and adaptive behavior of old groups of people, undercut by the overwhelming acceptance of this change, by the majority of people. The old to the new. To my surprise, as the bus is the equalizer, it is also the divider. Allowing for these displaced communities to get to and fro from where they had to leave. It allows for city expansion to occur and in turn, city change. The city will go on with or without these communities. So it is time to make the city realize these communities, we, exist. Listen to those old guys talking, help that Hispanic woman and her son, talk to the homeless guy next to you, do as much as you can to learn about people. This is the basis of changing a tide that caused a hurricane-- talking, organizing and changing. As the city does virtually nothing to help these displaced people, they matter to us as fellow Portlanders, as fellow humans. Sprinavasa (30) grew up in the neighborhood playing at Unthank Park and spending time after school at Self Enhancement Incorporated (SEI). Going to Catlin Gabel but living in North Portland gave her a unique perspective that allowed her to adapt to being in different situations with different types of people. Though she doesn't live in North Portland anymore, because four generations of her family have lived there, she still feels connected to the neighborhood. “What I love about the neighborhood is that you get a mixture of homes and businesses so it feels like a community, it feels like you’re in a city but yet you’re tucked away in your own environment." Sophie (16) has lived in North Portland since she was one. Though she's lived in a house on 7th and Knott, she has gone to school outside the neighborhood since Middle school at Da Vinci Arts Middle School and Catlin Gabel. “I love all the parks in the area because I have such good childhood memories with my best friend there." Tom (61) has worked in the neighborhood for over 45 years, teaching at Grant High school and Rosemary Anderson High School. He is passionate about the history of the neighborhood and leads walking tours to help educate people. “I still love to go to Dawson Park, hear music play, barbecue in the summertime, ya know when you can kick back and enjoy some of what used to be more present in the neighborhood."